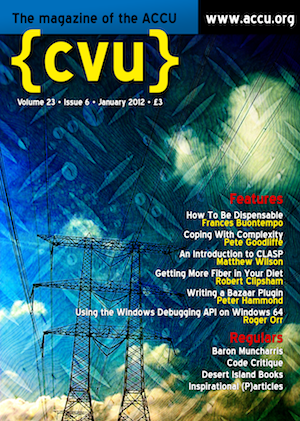 The January issue of ACCU's CVu magazine is landing on doormats now. It contains the latest instalment in my Becoming a Better Programmer column. This one's called Coping With Complexity. It an interesting wee treatise on managing (and fighting) complexity in our software. It's got sticks. And blobs. And people. I have to say, this month's issue is a bumper one - you never get a feel for this when reviewing the PDF galley proofs. Well done all involved.